On May 1 of this year I flew with Air Tahiti Nui to Papeete, French Polynesia. If this destination is on your bucket list, do what you can to make it happen. You will not be disappointed. I’ve seen photos of Tahiti and thought they must be Photoshopped, but after being there I can say that they are not. 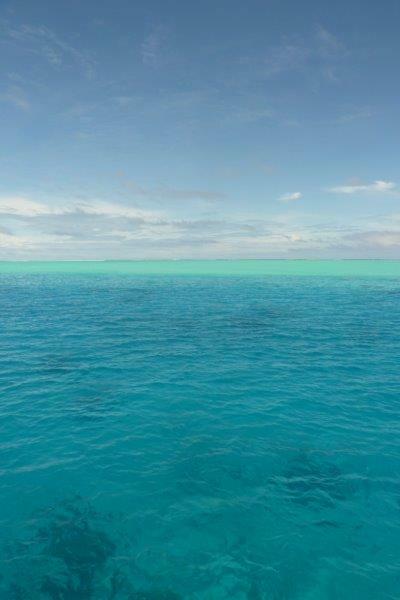 The oceans are just that blue and crystal clear. Tahiti and her islands are one of the most beautiful places on the planet, Heaven on earth for sure. Flying time from Los Angeles is 8 hours. You can either take a flight that arrives at 9:30pm or take an overnight flight that arrives early the next morning. For clients not wanting to stay in Papeete overnight, arriving in the morning works well as you can either board another flight to one of the islands or take the boat to Moorea. Upon arrival into Papeete we were met with beautiful fragrant flower lei’s and transferred to our overnight hotel. We Stayed at the Manava Suite Resort. http://www.spmhotels.com/resort This is a lovely hotel set on a beautiful beach with an amazing view of the island of Moorea. The room we stayed in had a kitchenette which would be great for guests who would like to stay longer than a night or two. The hotel includes a full breakfast buffet with hot and cold items. The next morning we started our island tour. Papeete is the largest island out of 118 islands and atolls. On our tour of the island we visited a beautiful forested area with amazing views of a huge waterfall. We wandered the trails and crossed a creek on our way, it was so peaceful. he raised his family. The walls are full of interesting old photographs of the many visitors to the house, including famous actors and directors. We were then hosted to a private lunch with a fish dish, fruit, breads and local desserts. Our last stop before taking the ferry to Moorea was at Le Marche de Papeete. This is a 2 story market that sells everything from fish, fruit and traditional Tahitian handicrafts. This is a must see for all that visit Papeete. ATM’s and banks can also be found around the market. This beautiful resort is located between two bays on the heart-shaped island of Moorea. It’s the perfect place to enjoy unforgettable moments from romantic dinners on the beach to exotic cocktails during sunsets. The 106 bungalow resort, the only 5 star hotel on Moorea, offers modern conveniences balanced with luxurious exotic wood interiors to create a relaxing Polynesian experience from the over-water to garden pool bungalows. The over-water bungalows have glass panels in the floor to view the ballet of tropical fish. All of the Garden bungalows have private pools on their terraces. The resort also offers 2 restaurants, 1 bar, 1 overwater creperie/bar, a spa, a fitness center and much more. On Saturday evening we attended a Polynesian dance show and enjoyed a buffet dinner. The show was very entertaining and the costumes were beautiful, the evening ended on the beach with a fire dance. The next day we were picked up at the hotel by a 4x4 safari vehicle and treated to an excursion of the island. We travelled all over the island, enjoying all of the beautiful sights the island has to offer. We stopped at a pineapple plantation and then drove up the mountain to Belvedere Lookout from where we had spectacular view of the two bays, Opunohu Bay and Cook’s Bay. The Hilton Moorea sits right in between them. Cruise ships also anchor off the tip between the bays. The safari is a great way to see the island or Car rentals and quads are another option for those who want to explore on their own. From Moorea we were off to Bora Bora. We checked in at the tiny domestic airport on Moorea for our flight to Bora Bora which took one hour and 20 minutes. We did touch down in Raiatea to pick up/drop off passengers and then onwards to Bora Bora. On the flight to Bora Bora, always try and sit on the left hand side of the aircraft for the amazing views of the mountain and resorts with the branches of the overwater bungalows. The Bora Bora Airport, also known as Motu Mute Airport, is an airport serving the island of Bora Bora in French Polynesia. It is located on the islet of Motu Mute and all transfers to the many resorts are by boat. We were once again met with more beautiful flower lei’s and shown to the boat that would transfer us to our hotel. The trip to the Hilton Bora Bora Nui Resort and Spa takes 20 minutes through the most amazing blue/turquoise waters that I have ever seen. The colour of the water is truly spectacular. Suspended between crystal waters and limitless blue skies, the Hilton Bora Bora Nui Resort & Spa offers a mind-blowing panorama! Situated on a private island or Motu, the 121 villas of this 5 star resort are surrounded by luxuriant nature and face a crystalline lagoon. All of the villas offer the latest standards of comfort and equipment in a Polynesian style and décor. In the overwater villas, you will be able to marvel at the underwater dance of colored fish through glass floor panels. The Resort offers 3 restaurants, 1 bar, a spa, a fitness center and much more. We checked into the hotel and were whisked away to our overwater bungalow by golf cart. I was amazed by the size of the bungalow; it boasted a living area, bedroom, huge bathroom with double sink vanities and a huge two tiered outdoor deck with lounging furniture and spectacular views of the ocean. You can snorkel, swim, paddle board and kayak right off the amazing beach. The sand is pure white and soft. The first evening we attended the Polynesian night with a traditional show and themed buffet. The show is typically held outside but a tropical storm was approaching so it was moved into the restaurant. went to another location to swim with the sharks. The guides were throwing out fish bait to bring the sharks to us, it was truly an awe inspiring experience. Our next stop was Hilton’s private island. The resort offers exclusive excursions to the Motu Tapu for its guests where you can have picnics, barbecues, weddings or romantic dinners. It is ideal for groups and incentives as well, organizing activities such as canoe races, lunch buffets, Olympic games etc. The cocktail Bloody Mary was invented at this restaurant/bar. The restaurant has been frequented by many of Hollywood’s most famous stars. There are several photos of the stars enjoying an evening at Bloody Mary’s. The food is fresh and tasty, you choose your meal by going up to a sample bar and picking from a choice of fish, chicken, beef or skewers. The floor of the restaurant is white sand and we sat on wooden stools. It has a very fun atmosphere, a must for anyone staying in Bora Bora. After dinner we went by boat back to our resort. The next morning we were picked up by boat and taken to Vaitape for our 4 x 4 Safari. It was so much fun, I can’t remember the last time that I’d laughed so much. We travelled around the island and then up into the mountains to see old WW2 cannons and the best views of Bora Bora. Tahiti is known for its Black Pearls so we visited a Pearl growing company where they showed us how the pearl is started in the oyster, how they grow, the harvest and the final product. They have a pearl store on site with amazing jewelry creations. We then went back up into the mountains and stopped at an artisan gallery where we were shown how the women design the Pareos (Tahitian for wraparound skirt) which are painted on site. They are more of a work of art than a skirt. After our last night in our overwater bungalows we were transferred by boat back to the Bora Bora airport to start our way home. Tahiti is truly paradise. I hope one day to return and spend more time exploring some of the other islands.